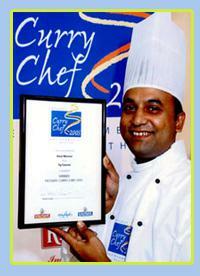 Abul beat off still competition to land the title of Medway Curry Chef of the Year. All asian restaurants in Medway were invited to enter the competition at the first round stage. Entrants were visited by Medway Council environmental health officials, and the top four chefs who emerged with the highest standards of hygiene competed in the final. Eight judges had the difficult task of deciding which chef had produced the best dish, marking their appearance, aroma, texture and taste. Abul says "I feel both happy and proud to have won, but everybody is a winner". Having competed at the highest level, with many Asian Restaurants both local and national, and winning a number of Restaurant and Curry Chef Awards Abul Monsur is recognised for having achieved excellence and recognition in Indian Subcontinent Cuisine. The Taj Cuisine situated in Walderslade Village, Kent, strive to provide the ultimate curry experience, offering from our restaurant menu, a wide range of fine Indian and Bangladeshi dishes. At the Taj Cuisine our menu not only covers a wide range of authentic curry dishes, we also offer sizzler dishes, korai and a selection of tandoori dishes, and have received excellent feedback from our clients. Come and enjoy modern and traditional Indian and Bangladeshi cuisine, our well trained and friendly staff look forward to serving you in our relaxed setting.